AMITYVILLE 3-D: A Fire Sale At The Haunted House – Schlockmania! Say what you will about The Amityville Horror and Amityville II: The Possession but at least they could lay claim to being inspired by true stories. No matter how far they strayed from the facts, they were lit up by a certain tawdry thrill of exploiting real events. 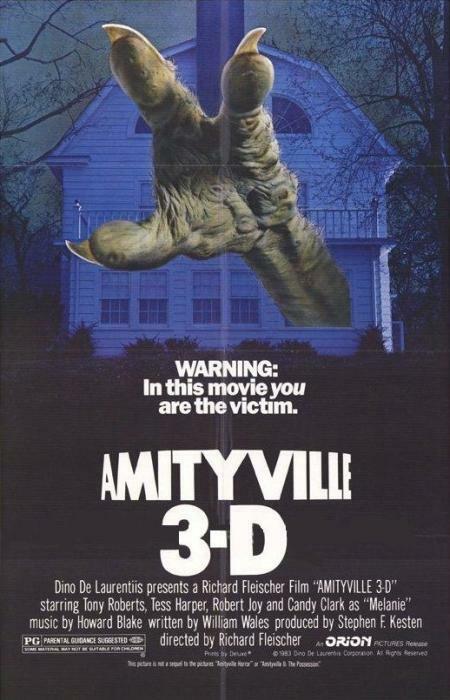 Amityville 3-D can make no such claim, as they’d run out of real events to pillage by that time. 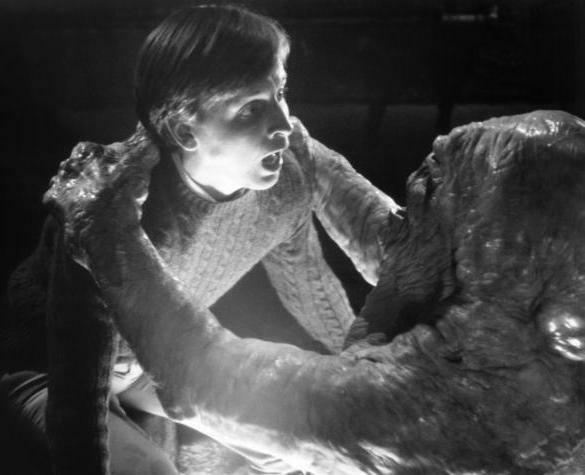 Instead, the filmmakers threw together a flimsy batch of haunted house tropes and hoped they could cover the seams by papering over them with 3-D effects. The results are easily the nadir of the theatrical Amityville trilogy. The plot gets rolling with the hoariest of haunted house flick cliches, “the skeptic who buys a haunted house to disprove it is haunted.” In this case, John Baxter (Tony Roberts) is a journalist who has made a career of debunking paranormal phenomena. After busting up a fake haunting in the Amityville house, he picks it up on the cheap to use as a base of operations while he pens his first book. In short order, the house begins play its spooky tricks on Baxter’s friends and family, including his daughter Susan (Lori Laughlin), bitter ex-wife Nancy (Tess Harper) and his photographer co-worker Melanie (Candy Clark). When the strange activity moves into lethal territory, Baxter teams up with paranormal specialist Elliott West (Robert Joy) to use science to combat the mysterious happenings, prompting a supernatural free-for-all for the film’s 3-D effects designers. As hackneyed as the plot might sound, the resulting film is even worse. Amityville 3-D is a tired, desperate affair. After a modestly amusing opening where a fake spook-show gets busted up, William Wales’ script becomes content to toss out one cliché after another: the doubting Thomas hero, a photographer who sees supernatural effects pop up in her photos a la The Omen, a Ouija game gone wrong, Poltergeist-inspired paranormal scientists studying the house, etc. There’s nothing here story-wise that you haven’t seen done several times already, even if you are only a mild fan of horror. To make matters worse, the direction from veteran filmmaker Richard Fleischer is perfunctory and indifferent. He musters up some decent atmosphere in spots but fluffs a lot of the film’s big shocks and uses the 3-D aspect of the film in the tackiest, most laugh-inducing way. It doesn’t help that said 3-D effects often look like cheap spook-show attractions, particularly if you see the film in 2-D. The film doesn’t really come to life until its final reel – and that part’s frenetic, “throw everything at the camera” vibe is more laughable than it is scary. The one dece nt asset of the film is a solid cast of charactor actors but even their efforts get wasted. Roberts is miscast and looks lost most of the time, Harper sleepwalks through her performance and Clark takes overacting into overdrive when she gets targeted by the spooks. Laughlin gives the best, most convincing performance but the scene-stealers are Joy as the paranormal investigator (he’s endearingly manic once he gets cut loose on the house’s phenomena) and a young Meg Ryan as Laughlin’s friend, who gives a goofy comic performance that suggests she realized how ridiculous this film is. In other words, Amityville 3-D ends this theatrical trilogy with a whimper instead of a bang. It’s little more than a cash-grab designed to squeeze the last few dollars out of an exploitable name – and it doesn’t deliver much in exchange for the price of admission.